Yes, another month has flown by and it’s time for the Secret Recipe Club once again! Those of you who follow this blog already know the deal (and many of you also participate in SRC!) but for those who don’t know, it’s a simple, fun concept: All participating blogs are assigned another blog. We get to choose any recipe we like from that blog and make any changes we want. Then we all post our recipes on the same day and time! It’s a wonderful way to meet other bloggers and try recipes you might not otherwise. This month I was assigned Ruchi’s Simply Food. Ruchi is North Indian and was raised in Mumbai, so many of her recipes are Indian-inspired, which works out perfectly because I love Indian food! 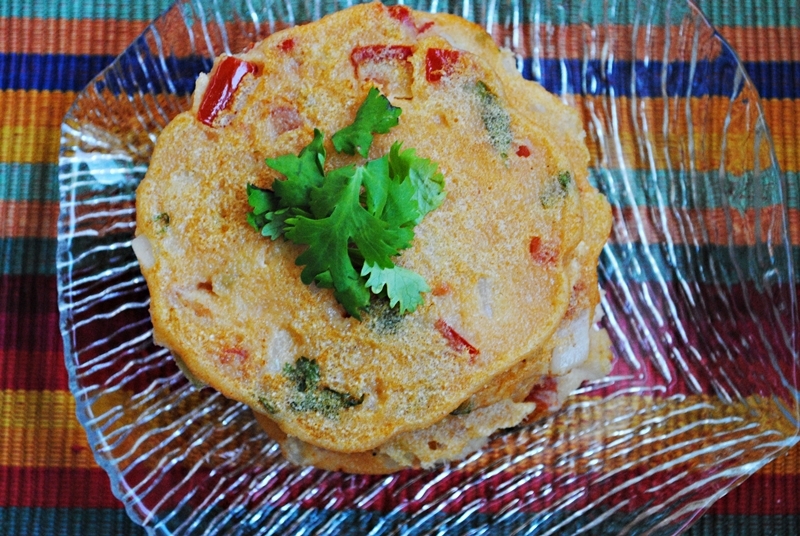 I had a hard time picking a recipe but quickly settled on these Rava Uttapam, or savory pancakes. When I studied abroad in India in college (many years ago now…) I ate many uttapam and so these brought back wonderful memories! I also love savory pancakes of any sort – Chinese scallion pancakes, Korean kimchee pancakes, Eastern European potato pancakes – you get the idea. I also liked how quick, easy, and adaptable this recipe is. You can add chopped vegetables to make it even heartier or leave them plain for a simple snack. Although Ruchi suggests having it for breakfast, I had it as a side for dinner. Both my husband and I loved them! These savory pancakes come together quickly and are great for breakfast, but also make a great appetizer or side for dinner. Mix together the semolina flour and yogurt to form a batter. It should have the consistency of pancake batter; add a couple of tablespoons of water if necessary to make the batter easily spreadable. Mix in the salt and the oil. Allow to rest for 20 minutes on the counter. Heat a little bit of oil in a non-stick skillet. Pour a ladle of batter and spread a bit. Add the chopped onions, tomatoes and coriander. Let it cook for a couple of minutes on one side and then flip. Cook for another couple of minutes, till the batter is set (cook as you would a pancake, although it takes a few minutes longer since it is thicker and denser). Remove to a plate and repeat with the remaining batter. Sprinkle with cilantro garnish and serve. Thanks Anne! I love what you did with my recipe – I’m going to try it your way next time!! We love these pancakes and they are so adaptable to flavors and what I have on hand, great SRC choice. If you haven’t already, I’d love for you to check out my SRC recipe this month: Levain Chocolate Chip Walnut Cookies. Thanks Lisa! Yes, I love how adaptable they are. I’m off to check out your recipe now! How exciting. I am a bid intimidated by Indian food, but this looks delightful! Perfect SRC choice! I love your blog, I am your newest Facebook Fan! If you haven’t seen my Low Calorie Greek Baked Eggs yet, I would love for you to check out my SRC post. You should join Giulia! It is so much fun! You would love it. Thanks Sara! It was great. I know!! I bet it’s amazing for breakfast, I need to try that next! wow, these look great and super simple. I love the fact that the blog took you right back to your days in India. Do you think it would work with chickpea or perhaps sorghum flour and soya yogurt so it could be vegan and gluten free? I definitely think it would work with soya yogurt and I’d love to experiment with chickpea flour, I think that could work! If you try let me know how it goes! Oh loving how colorful these are! We love Indian food in our house and I really enjoy cooking it. Will have to try adding this one next time I am making a curry. It would great as a side. Love the way it looks so gorgeous and colorful… so glad you liked the pancakes :)! Where did you study during your time in India? Thank you Ruchi! It’s such a great recipe, thank you for sharing! We traveled all over India but were mostly in Delhi, Jaipur, Varanasi, and Mussoorie with a brief 10 days in Kerala! So incredible. I have wanted to go back ever since. These sound really good. I love savory pancakes and the spices sound wonderful. Thank you Susie! I also love savory pancakes – so good! The fresh onions and tomatoes peeking through these pancakes are telling me I definitely need to try these. Unique and tasty pick for SRC-yum! I hope you do try them! So easy and tasty 🙂 Thanks Tina! This sounds like a terrific side dish. I can see this as it’s own course at one of my dinner parties. Bookmarked! How nice! I am having some Indian friends over in two weeks for dinner and I will definitely remember to her blog before I settle on the menu. Don’t cook Indian at home, but I guess I should start soon! Easy and much better tasting than restaurant food! Thanks for the great recipe, both of you ladies! So far my most favorite savory pancake is the scallion pancake, but that can change. 🙂 These look awesome! Haha thanks! Yes, it was a great recipe to follow! Katherine, they look perfect, I love uttapam too! Way to go! Aw thank you Trish! They were so easy to make! I’ve never tried uttapam. 🙁 By looking at your pictures this looks really delicious and it sounds like a healthy snack for my children! Those look fantastic. Great choice for the SRC, I will have to check out Ruchi’s blog. Thank you Carolyn! Definitely check out Ruchi’s blog, it’s lovely! Oh I love Indian food so you got a great pick, And how awesome you have been to India. This is a very simple recipe but sometimes they are the best, great rendition. I love Indian food too! It’s been ages since I’ve been, I miss it so much! Yes, the simplest recipes really are often the best! Thanks Peggy!! These would be great with curry! I didn’t even know what Rava Uttapam was until i read this – so interesting and great choice. Yes, it’s definitely not something that shows up too often, but it’s so easy and delicious it should! Indian food is the best. Great recipe – easy, and looks mighty tasty. Good stuff. Thanks. I totally agree! I also love how easy this recipe is – and tasty! Indian food is my weakness. I can never get enough of it. These pancakes look delicious and I love the colors! Hahaha I feel exactly the same way!! these look like a great light dinner. I love all the ingredients, but I have never been lucky enough to try the real deal. I am going to try these! I hope you enjoy these Susie! They were so easy to put together, they will definitely be gracing my table often. This is a very interesting recipe, and it looks like yours turned out wonderfully! I cannot wait to try this. Thanks Elle!! They’re super simple to make. I’ve never heard that name before but boy are those pancakes pretty and colorful. I like that they are savory. Great pick! Katherine — thanks for the great recipe and pictures. I shared it with facebook.com/uttampam fans on facebook. I hope its ok with you. Correct: I shared it with facebook.com/uttapam fans on facebook. I hope its ok with you. Hey! I’ve got something similar, too, but with chickpea flour, just in case you’re curious: Mediterranean Chickpea Flour Pancake–I can’t figure out how to just add the link. Love your blog and super excited to make some recipes from it this weekend for Shabbat Hope all’s well! Hi Lauren, chickpea flour sounds like a great idea in a pancake like this I will have to give it a try! I’ll find it on your site 🙂 I hope you’ve had a nice weekend!